Huge congratulations to Jason and Spencer, who were married at the fabulous Roslin Beach Hotel in Southend. 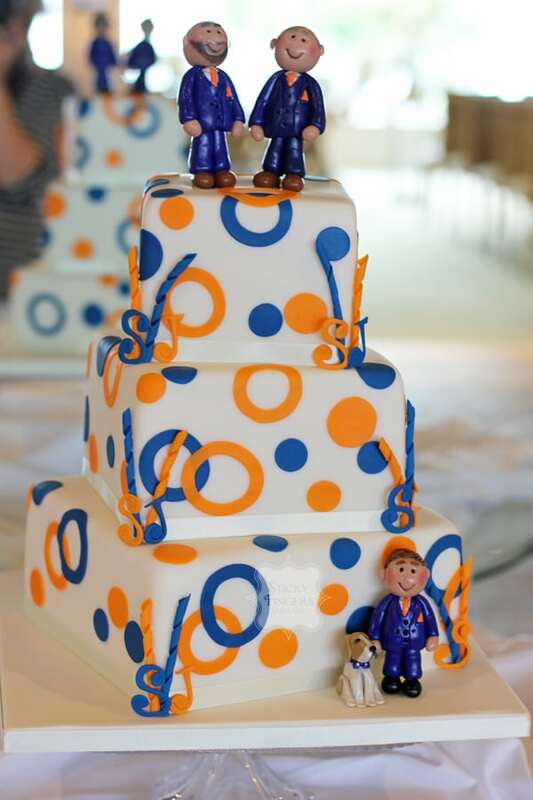 It’s lovely when a couple come to us with firm ideas of how they would like their wedding cake to look, so when Jason and Spencer came up with a bright blue and orange colour scheme I knew their wedding cake would be really funky. So with that in mind, along with their input, I came up with a square twisted design wedding cake with retro circles and squiggles; it matched the guys’ personalities so well! And their cute cake toppers were amazing! Their yummy flavours were Cherry Bakewell, Lemon and Black Forest. Such a fun wedding cake, thank you for choosing Sticky Fingers Cake Co to make it for you. I wish you a long and happy life together!